A partnership that links the companies’ digital assistants is not only a sign of the maturing relationship between the two, but it also is expected to help both expand their audiences and fend off other rivals in the competition to build voice-activated software. Thanks to a bit of personal diplomacy, the Seattle area’s most important corporate rivalry grew a bit friendlier this week. Amazon.com Chief Executive Jeff Bezos and his Microsoft counterpart, Satya Nadella, agreed to link their digital assistants, a rare partnership of cutting-edge and competitive technologies. The fruit of that pact arrived Wednesday with the announcement that Amazon’s Alexa and Microsoft’s Cortana will soon be able to summon and use the capabilities of the other. The alliance is not only a sign of the maturing relationship between the competitors, but it also is expected to help both companies expand their audiences and fend off other rivals in the competition to build voice-activated software. The tie up surprised technologists who had watched the online retailer and business-technology behemoth increasingly compete with each other. Amazon’s Web Services (AWS) unit, the company’s most profitable division, is the dominant player in cloud computing — the business of selling rented computing power and software that is pressuring traditional business software builders like Microsoft. Microsoft has responded by pouring billions of dollars into an effort to reshape its software to compete with AWS — fashioning a cloud-computing unit widely seen as No. 2 behind Amazon. The two also fight over employees. Amazon’s yearslong hiring spree has often reached into Redmond, scooping up members of Microsoft’s executive ranks, research and development teams, and marketers. Occasionally, Microsoft returns the favor. The winner, observers say, may be the companies’ customers. Users of Amazon’s Echo speakers will be able to ask Cortana to check on a Microsoft-managed workplace calendar, for instance, and Windows 10 personal-computer owners can ask Alexa to place an order on Amazon. The capabilities are expected to roll out later this year, the companies said. Data won’t be shared between the two. Once an Alexa user has invoked Cortana, for example, subsequent commands will only be stored by Microsoft, and vice versa. 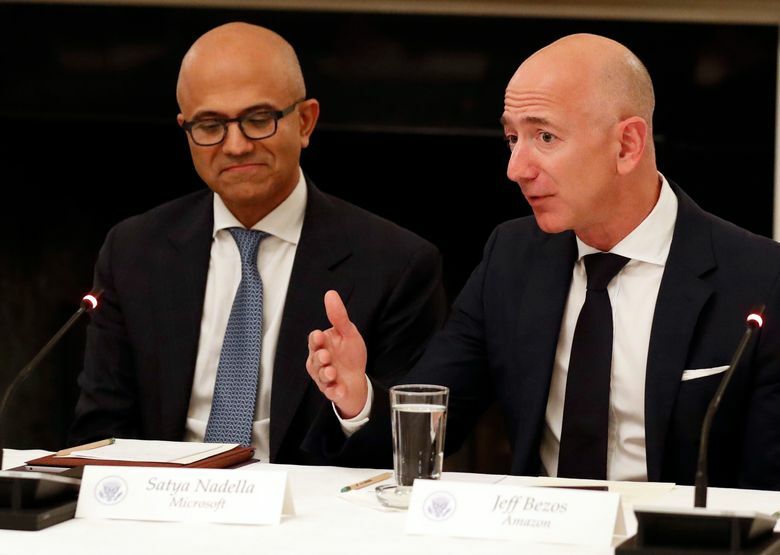 Bezos approached Nadella with the idea to link the products at a Microsoft event in May 2016, The New York Times reported. Since then, Amazon has sealed its place as a leader in the market for digital assistants. The company says Alexa lives in tens of millions of devices, from its own Echo speakers to Fire-branded televisions as well as appliances built by other companies that incorporate the software. Alexa’s profile also has soared in the past year. The software was the clear standout at the Consumer Electronics Show in January, as builders of all types of electronics rushed to announce plans to let Alexa control refrigerators, smart thermostats and more. Technologists expect future generations of voice-activated software to increasingly displace mouse, keyboard and touch input. Alexa seems well on the way to being the first widespread manifestation of that in the home. But Amazon’s reach is more limited in the workplace, Cortana’s primary realm. The Microsoft assistant’s most useful features, analysts say, include tasks tied to Microsoft’s Office software, like scheduling appointments and reminders. Both Amazon and Microsoft are also trying to keep pace with Silicon Valley rivals: Google’s Assistant and Apple’s Siri, which, thanks to those companies’ duopoly in the smartphone market, have large and captive audiences. “Necessity is the mother of invention, and this is something they realized they needed to do,” said Bob O’Donnell, who tracks technology at Technalysis Research, reacting to the Seattle-area companies’ alliance. Nadella’s willingness to work with Bezos is a sign of the change under way at Microsoft, a famously hard edged competitor that has recently shown a tendency to find ways to partner with foes. Microsoft has pushed more of its formerly Windows-bound software to Google and Apple smartphones. And last year, the company agreed to a truce in long-running battles with Google over smartphone patents and antitrust issues, a move many observers attributed to the influence of Nadella and Google’s Sundar Pichai.